Illuminate love with this divine heart necklace inscribed in 24k gold with I love you encompassing the cubic zirconia heart-shaped pendant. 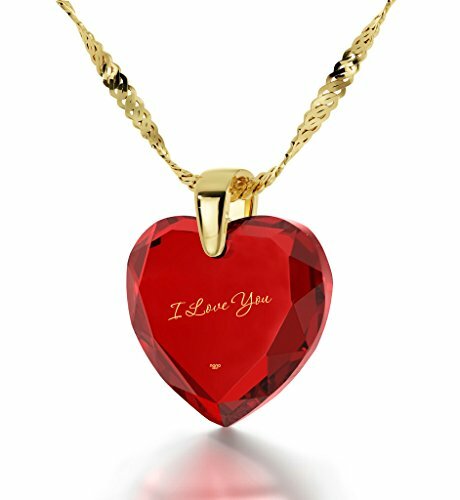 The I Love You heart pendant necklace, is beautifully inscribed in 24k gold using innovative technology, allowing us to write the smallest text on the surface of the cubic zirconia gemstones. The elegant heart shaped cubic zirconia stone, 0.6x0.8 in (21x17mm) including the gold plated bail, gracefully dangles from a gold filled Singapore chain, measuring 18" (45cm). If you can't say it enough, show it, with this enchanting, romantic anniversary, valentines day, Christmas or birthday gift idea. Sure to leave a lasting impression, this romantic necklace makes a great gift for any loved one; your wife, girlfriend, best friend, mother or a special treat just for you! Available in an array of lively cubic zirconia colors; timeless clear white crystal, romantic red, enticing light purple, tranquil blue or classic black, the perfect match is just waiting to be shown off by that special woman in your life! A gold filled, high quality, traditional Italian chain measuring 18", 45cm, elegantly suspends from the heart shaped cz gemstone measuring 0.8 inches (17mm), (0.8x0.9 inches (17x21mm) including the gold plated bail). 925 Sterling Silver I Love You Necklace Solitaire Pendant 12 Languages Inscribed on Violet Crystal, 18"
14k Yellow Gold 0.9mm Braided Wheat Chain Necklace with Lobster Claw Clasp - 18"